Delicate natural engineering has given us this sparkling Arkansas floater cluster of clear rare white phantom crystals [titanium] - some with sand inclusions, on and through a plate of shimmering clear and white quartz drusy. 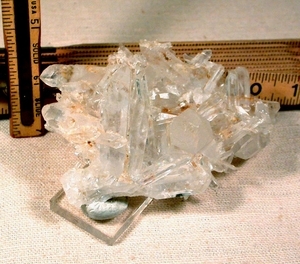 3x 4-1/4x 2-1/4" high, supported by two doubly-terminated crystals [one with a diamond window], you'll see penetrated crystals, Hera crystals, a missing crystal, twins, needles and rainbows. Not to be missed: a doubly-terminated white phantom in a 2" tall multi-penetrated host, much better in person.